Chalk acrylic varnish paint spray clear colorless quick drying 400ml.Clear, colorless and quick-dryi..
Chalk spray paint 788 broken white Pinty 400ml.Decorative chalk spray paint. Extremely matte finish ..
Chalk spray paint 789 cream Pinty 400ml.Decorative chalk spray paint. Extremely matte finish with ve..
Chalk spray paint 790 chestnut brown 400ml.Decorative chalk spray paint. Extremely matte finish with..
Chalk spray paint 791stone 400ml.Decorative chalk spray paint. Extremely matte finish with velvety a..
Chalk spray paint 792 pink petals Pinty 400ml.Decorative chalk spray paint. Extremely matte finish w..
Chalk spray paint 793 rose garden 400ml.Decorative chalk spray paint. Extremely matte finish with ve..
Chalk spray paint 794 mint green Pinty 400ml.Decorative chalk spray paint. Extremely matte finish wi..
Chalk spray paint 795 blue indigo Pinty 400ml.Decorative chalk spray paint. Extremely matte finish w..
Chalk spray paint 796 pale turquoise 400ml.Decorative chalk spray paint. Extremely matte finish with..
Chalk spray paint 797 turquoise 400ml.Decorative chalk spray paint. Extremely matte finish with velv..
Chalk spray paint 788 ash grey Pinty 400ml.Decorative chalk spray paint. 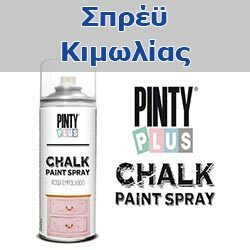 Extremely matte finish with..
Chalk spray paint 799 black plumb Pinty 400ml.Decorative chalk spray paint. Extremely matte finish w..
Chalk spray paint 800 beige sahara Pinty 400ml.Decorative chalk spray paint. Extremely matte finish ..
Chalk spray paint 801 mustard 400ml.Decorative chalk spray paint. Extremely matte finish with velvet..
Chalk spray paint 802 peach Pinty 400ml.Decorative chalk spray paint. Extremely matte finish with ve..
Chalk spray paint 803 olive vintage olive 400ml.Decorative chalk spray paint. Extremely matte finish..
Chalk spray paint 804 red velvet 400ml.Decorative chalk spray paint. Extremely matte finish with vel..
Chalk spray paint 817 london grey Pinty 400ml.Decorative chalk spray paint. Extremely matte finish w..